“Your content is probably crap.” That’s how Mike Atherton and Carrie Hane open their book, Designing Connected Content: Plan and Model Digital Products for Today and Tomorrow. The book explores the reasons why your content is probably crap and walks you through the process of shaping, sharing and improving your content strategy. At New Breed, we’ve been actively working to hone our content strategy. We tasked our entire website development team with reading Atherton and Hane’s book to gain a better understanding of content strategy and design — because, ultimately, implementing a more intentional content strategy aids in designing better, more scalable websites. Too often, web developers push research to the wayside because of tight timelines and limited budgets. But understanding the subject matter is a critical step in designing a website that truly supports the content it contains. Your ability to pull apart the subject, identify key ideas and use the language that appeals to real-world subject matter experts is key not just for websites, but for any digital platform you’re building. That way, the interface, information architecture and overall design will work to enhance the content of the website and improve the web visitor’s ability to find the information they’re looking for as quickly and easily as possible. Like the inbound philosophy, creating connected content is all about empowering the end-user. Remember, your website isn’t for you or your company — it’s for your prospects and customers. Once you’ve gained a deeper understanding of your subject domain and understand the keywords, pain points, goals and ideas that go into that subject, it’s time to build a domain model. A domain model provides the core framework for organizing your content in a way that addresses users’ actual needs and interests. This is where the “connected” piece of designing connected content comes into play. What are the key terms and topics branching from the overall subject, and how do those terms and topics relate to each other? Again, this concept can be applied to any kind of platform or interface. The specific relationships between ideas are platform-agnostic, and the connections you make between those ideas should inform your website design, not the other way around. Additionally, you should take the time during this stage of web content mapping to establish a common vocabulary and agree on the definitions. That way, everyone building, using or editing the website can be on the same page. For example, one conversation we commonly have with clients at New Breed is about the difference between a product and solution. Are those terms interchangeable? If they are, choose one and use it ubiquitously throughout the website to avoid confusion. A content model documents all of the different content types associate with your subject domain and outlines the relationship between those types. At this stage, you’re going from the abstract structuring of ideas in the domain model to actually nail down the specifics of your content types. By content type, we mean “a reusable container for managing content by common structure and purpose,” not a content format like videos, blogs or white papers. For example, if several key subjects outlined in your domain model involve people, you could create a reusable content type that structures common attributes like name, job title and company. Every piece of content that discusses people will be organized in the same way, providing a consistent, easy-to-understand user experience. Consistency, as you probably already know, is incredibly important for effective content strategy and web design. A coherent design system should deliver similar content in similar ways, so users understand the kind of interaction they’re going to have. In other words, focus in on the details, ideas and relationships that are directly applicable to your business. Be careful about which pieces you remove, though — does removing it alter other important connections between ideas? Now that you’ve planned and outlined all of the connections between your content, you can begin writing. Apply the structure you’ve created to match the end-users’ real-life mental models and ensure a seamless user experience via well-designed content. And because you’ve put in the initial work to actually design your content, writing that content should be a simple, scalable process. Even if you decide to add, remove or change pieces of your content, you shouldn’t have to scrap what you’ve done. As you’re designing and developing connected content, be sure to publish one principle resource based on the original domain topic. Generally, this takes the form of a pillar page or definitive guide. As the subject grows and your business scales, you’ll only need to update the one resource rather than having to update 10 different pages with scattered ideas. Too often, content strategy is pushed to the end of the web development process. You need to establish a content-first mindset to create truly valuable content and build a website that amplifies the value of that content. Remember that as you’re designing your content and building your website: Content is why people come. 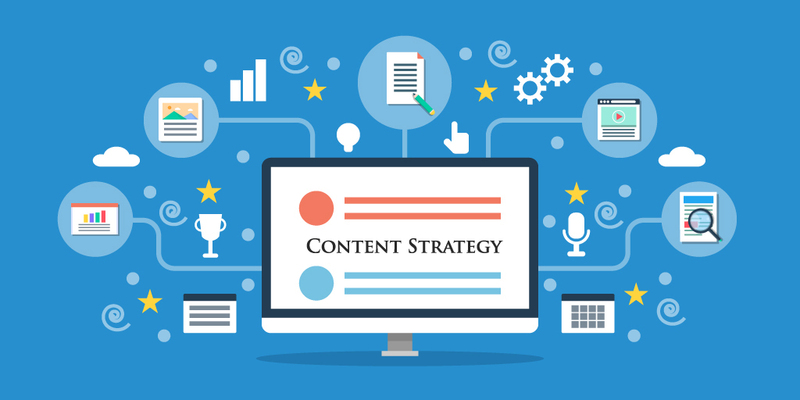 Instead of shoehorning content into a website after the fact, the website should be built from the ground up to assist users in understanding that content.